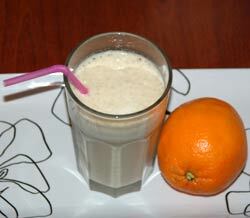 This great tasting banana smoothie is perfect for breakfast or for cooling down on a hot day. The smoothie is surprisingly sweet but has no added sugar and has a low glycemic index. It is a great way to use up left over bananas. This simple recipe is in my opinion best made with bananas that are starting to go over ripe but fresh bananas can also be used. Peel the banana and cut into slices then put in a freezable sealed container and freeze over night. You can freeze them for longer but I recommend using them within a month. Remove the banana from the freezer and put in the blender. Add a shot of boiling water to the banana to speed up defrosting, it will have little affect on the taste. Use a pulse technique to blend until a smooth paste is formed. 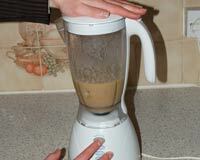 Each time the blender struggles add a shot of boiling water, don't push it too hard or you may break it. 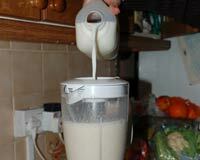 Slowly add the milk whilst continuing to pulse the blender. Once well mixed in serve in a glass.